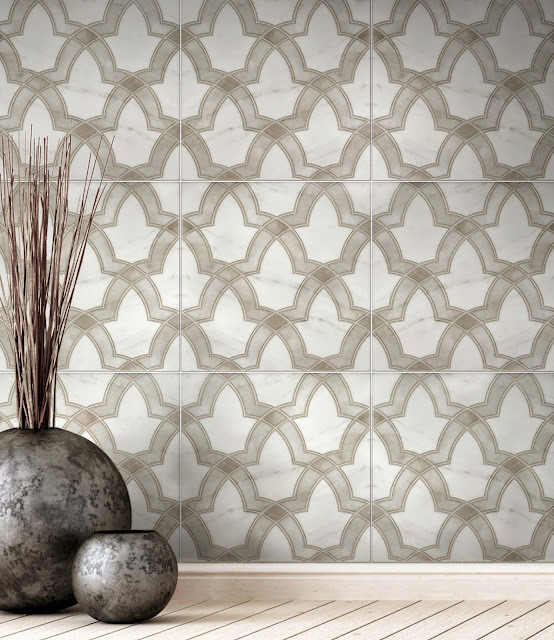 To celebrate the success of the showcase at Coverings 2015, we want to give our blog followers and faithful designers some in depth knowledge on the Artisan Stone Tile Carrara line. So, for the coming weeks, we'll post about some of our favorite new designs and talk about some insight from the artist herself, Melinda Earl! Evolve, one of our most prominent new designs in the Artisan Stone Tile Carrara Line, is shown above. The unique negative space in this design creates a pattern similar to a budding lotus flower. The calming Oyster color allows the tile to sit comfortably in the background, accentuating the features of the room, without demanding too much attention. The Carrara stone has unique natural veining across its face, giving the subtle reminder of its organic origins. The Evolve is available as a large 12" x 12" tile, which is where the design is truly able to flourish! The tile is gorgeous! I like it enough that I would probably be willing to put it in every room no matter how ridiculous that would look. Thanks so much for sharing.